Starting toady, I am the proud new owner of Pink Chalk! Earlier this month, Kathy posted that she was leaving the business and looking to sell Pink Chalk. That made me so sad. It would be the end of an era. I have watched and admired as Kathy grew her business and inspired and encouraged the sewing community. I knew that it was not time for the Pink Chalk story to end. 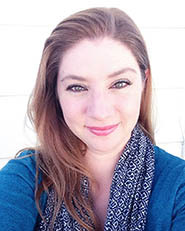 After pacing and ranting to my husband, I realized that there was something I could do about it. I could be the new owner and carry on where Kathy left off. As crazy as it sounded in my head, when I said it out loud it felt right. I also have a passion for fabric, sewing, and this awesome handmade community and I can't wait to get started. This blog (little bluebell) will remain as my personal blog and I will continue to write and share about my projects here. 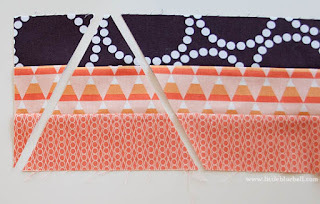 I will also be blogging about fabric, books, patterns and tutorials over at Pink Chalk. There is something about this time of year that fills my heart and reminds me of the wonderful people in my life. It is so fun to wrap up little surprises and send some cheer. I was writing down a list of all my favorite quilting tools and I kept thinking about you. You are my favorite! I am so grateful for this quilting community. Thank you for your incredible, ongoing support. 1. OLFA 28 - This rotary cutter is a specialist. It is the perfect size when working with templates, curves, or paper piecing. 2. OLFA 45 - I have tried so many different rotary cutters and I always come back to this one. I've had it for years and it fits perfectly in my hand. It's easy to squeeze the handle to uncover the blade which automatically goes back into a covered position when I set it back down. So easy. 3. ADD A QUARTER - A must have for paper piecing. I like the larger 12" size. 4. WONDER CLIPS - These little guys are so handy in the sewing room. I use them on binding, zippers and bulky projects. They are also good when you are sewing with leather or plastic because they don't leave a mark. 5. OMNIGRID RULER - Out of all the rulers I've tried, these are my favorite. The markings are easy to read and accurate. This size fits easily under my hand and is perfect for cutting out smaller pieces and squaring up blocks. 6. AURIFIL THREAD - Strong, smooth thread that makes my seams lie super flat. Yes, please! 7. PATCHWORK PINS - I've gone through so many types of pins, but these are perfect. Sharp and super thin. They glide in and out of the fabric with ease. 8. SEAM RIPPER - Sometimes simple is best. This fits comfortably in my hand and is sharp for tackling any necessary un-sewing. I replace mine every so often because the blade does get dull over time. I buy two because I tend to lose them in my sewing room and they aren't very expensive. I'm giving away a set of my favorite quilting tools. Every single one of these items is on my worktable and I wouldn't work without them. 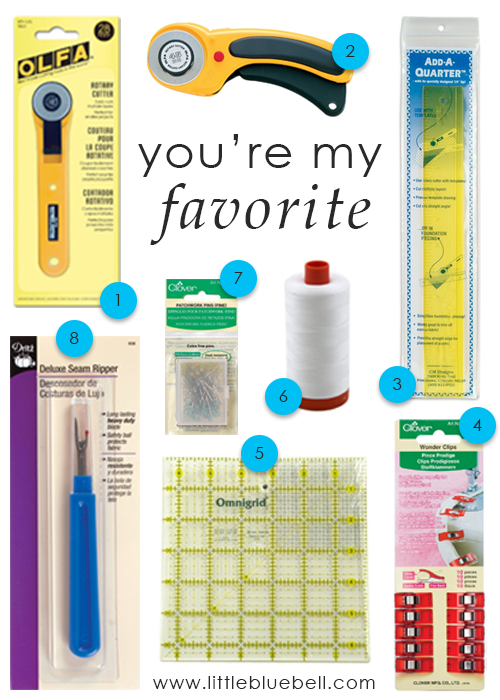 2) leave a comment below, what is your favorite quilting tool? Giveaway ends 12/16/15 at midnight PST. International entries welcome! Winner will be posted here on the blog. It's hard to remember where this quilt started without a visit to the way back machine (aka an old blog post from 2012). The Guising fabric collection by Lizzy House had just come out. It featured the cutest little ghosties and geometric candy corn. It was sweet without being too sweet, and quirky in the best possible way. I loved it and wanted to make a quilt for Fall/Halloween for my family to snuggle under while passing out candy to trick-or-treaters. I first paired the fabrics with taupes and creams and it was a little too tame for me. The more color and pattern I added, the more I liked it. The background was chosen after laying my fabrics out next to a color card and looking for the one that made everything pop. It turned out to be a saturated red-purple color which happily surprised me. It was similar to one of the deeper tones in the Tufts print from Outfoxed, also by Lizzy House. 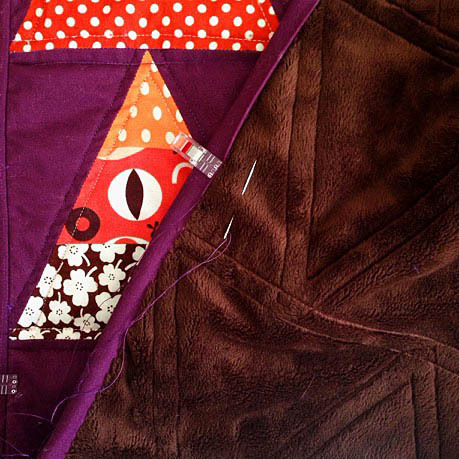 The backing is a deep chocolate minky fabric that I ordered from Harts Fabrics. I used cotton batting too, so it's extra snuggle and warm. Perfect for this time of year. It feels really good to have this quilt finished and now that it's done, I'm ready to put up my Christmas decorations. 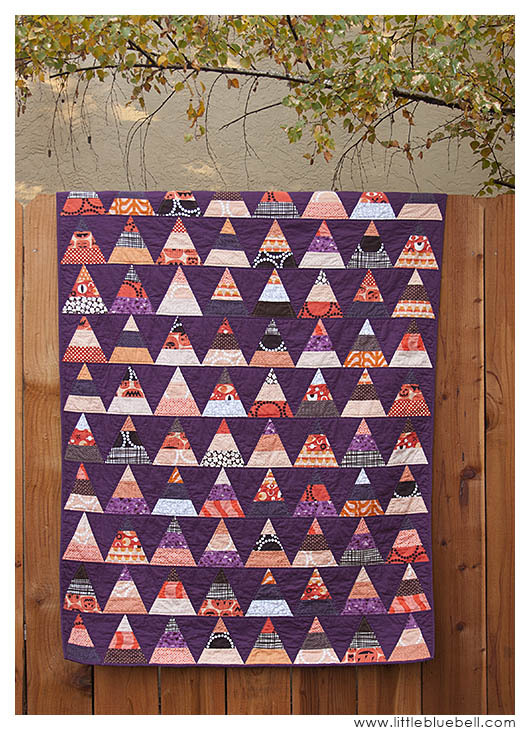 Change the colors and it could totally be a winter quilt!